Somewhere in between the starkness of Minimalism, and the burden of Maximalism, there is Moderatism, the middle way. My son is a natural born minimalist. I really don’t know how he does it. I guess he’s just not sentimental at all. And not attached to material stuff. I find it very impressive. Although sometimes I find it frustrating because he’s so quick to get rid of all the stuff that I paid for! Tonight I asked him to put his laundry away. He came to me 30 minutes later and said, I put my laundry away, and I cleaned my room, and I moved out all the stuff I don’t want. All this came out of his room, mostly his closet. I think he’ll regret getting rid of the fans come summer. But he’s right, most of it probably should go. 365 Challenge Day 153 – Yoga, again! Went to class again!! Today was the last day of my unlimited pass, I definitely got my money’s worth out of it!! AND, I went for a run!! The fact that I was able to go to class and go for a run on the same day is huge progress, means my endurance is definitely improving. And the run was amazing. Before I had been using this app called Map My Run. It was great to measure my speed and distance. BUT, what I hadn’t realized is I think I was pushing myself to run a little a faster than my comfortable pace. Today I didn’t use the app, I just ran at a slow and comfortable pace, and instead of usual two miles, I went two and a half! AND with less strain. Food: Peanut noodles with organic brown rice pasta and steamed broccoli. 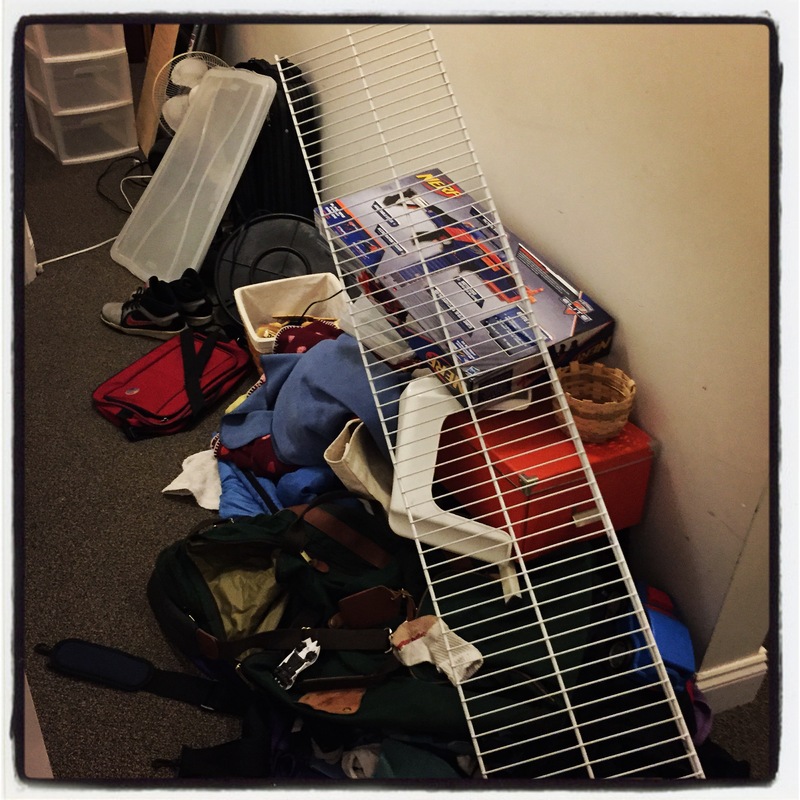 Decluttering: Today I was a DECLUTTERING maniac!!! Is it possible my inner minimalist is finally finding her way to the surface?? I worked on my bedroom today. My bedroom usually looks pretty neat, but there was lots of hidden clutter. LOTS. I went through so many boxes. I recycled several bags of papers, threw away lots of crap, and have two bags of giveaways including many books. I have more empty storage boxes and shelves than I even know what to do with!! I’m feeling a little discouraged in the organizing/decluttering arena. I may have hit a plateau. I pulled out a box of summer stuff that was buried in my closet. I knew there were things in there that I had not worn in many years, so I thought I would easily get rid of a lot of it. But, it turns out there is a reason I have held onto that stuff so long!! It’s nice stuff!! Now I am struggling between acknowledging that there are items I have not worn in more than a decade (!!! ), and the fact that I actually still really like the stuff and think I should keep it and wear it!! I have several long, fitted skirts that were tailor made for me in Senegal, ummm… I don’t want to admit this, but that was 20 years ago. I guess I should be ecstatic that twenty years and two pregnancies later they still fit! I know I need to get rid of them. I also have three linen dresses, a little shorter than I tend to wear these days, and very wrinkly, but still very nice. Can’t quite bring myself to throw them in the give away. If I can’t bring myself to get rid of a box of clothes I haven’t worn in a decade, what hope is there for me as a minimalist?!?! I am so excited. 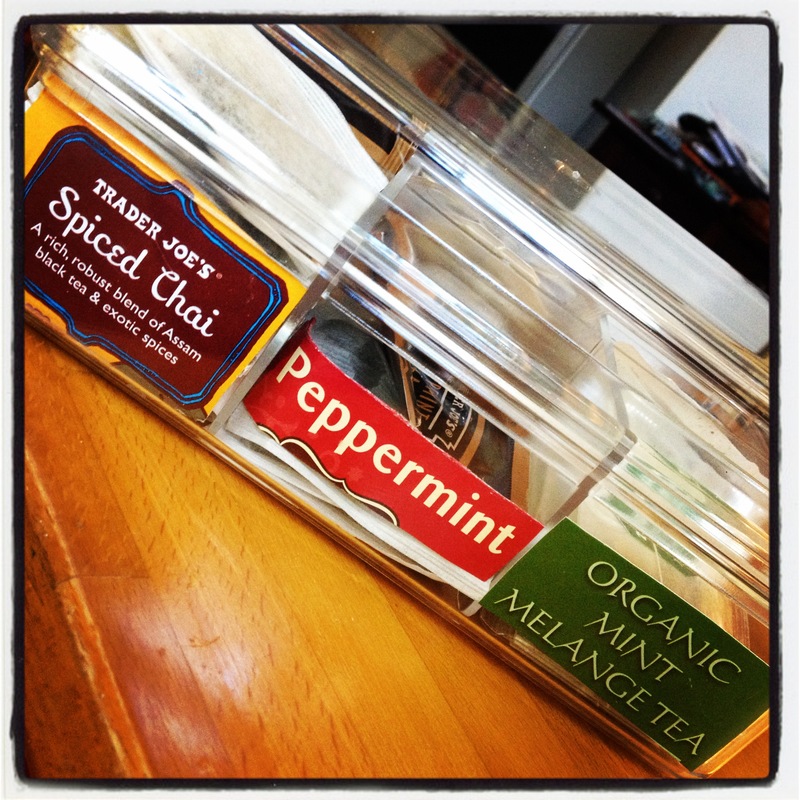 I went on a crazy adventure yesterday to find the perfect spice jars. I can’t believe I’ve turned into a person willing to spend $100 on perfect spice jars!! Who is this person?? When I lived in Senegal for three years I owned one towel, which I used for home and the beach, and it also served as a potholder!! I don’t think I owned any spices, just salt and pepper! Well, those minimalist days are truly over. I admit to owning a lot of crap, including 34 varieties of herbs and spices (yes, I counted.) And now my task is organizing it all. I have a very small kitchen. I like it because everything is always within reach and it’s very convenient, but because I like things out of sight and off the counters, it does feel very limited for space. I cook a wide variety of foods so I have a lot of spices, from Indian, to Latin American, to African, to Asian, oh yeah, and European and American. I had a drawer devoted to spices, but it just wasn’t big enough. I added a spice shelf to the inside of one of my cabinets, which seemed like a good idea, but cabinet was so full I could never close it all the way! In the end I had spices stored in three different places. It was messy, took up a lot of space, and I’d often look in three or even four different places for something as simple as cinnamon! I HAVE FOUND THE PERFECT SOLUTION!!! 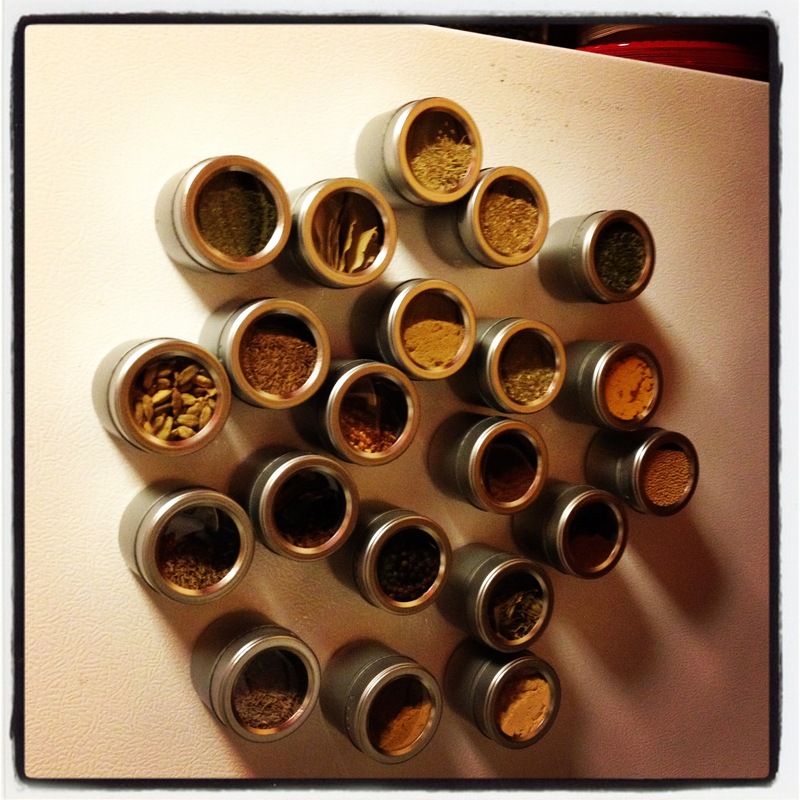 These are magnetic spice jars from The Container Store, stuck on my fridge. The reason yesterday was such an adventure is because I first went to Ikea (an insane thing to do on tax-free weekend!!) I bought the magnetic spice jars from there, but they were HUGE. Four inches across. So, actually, at the moment I have spent a whopping $200 on spice jars, but the Ikea ones will be returned. I stopped at the Container Store on the way back and these were PERFECT. They hold the entire contents of the standard sized spice jar. They even have little cut outs so you can twist the top and shake out the spices without having to open the lid. I also bought pre-printed labels which are on the sides. This was more about organizing then about decluttering, although I did find some duplicates to consolidate. The only thing I considered actually getting rid of was the white pepper, which I don’t think I’ve ever used! Woah, I really got out of the habit of posting every day when I was on retreat, and now I have some serious catching up to do! I really dislike all the paper that accumulates around my house, but am often nervous about getting rid of stuff. This is the perfect solution. 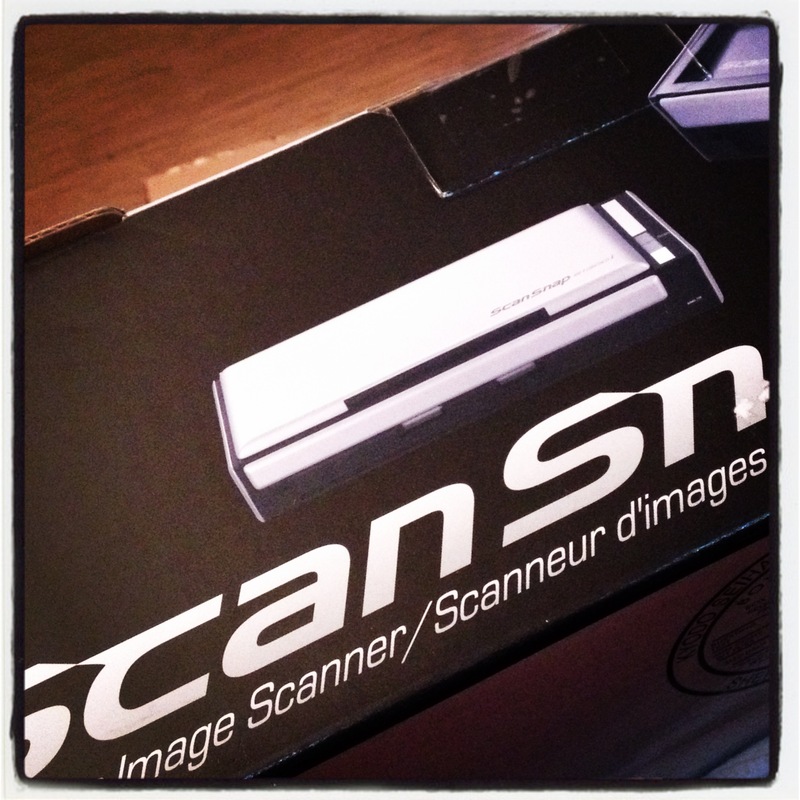 So I bought this fancy scanner, called a ScanSnap. It can scan papers, business cards, receipts, photos, etc. It can scan both sides! It has text recognition and can convert paper docs to readable PDFs. And, it can send the electronic documents directly to your cloud storage such as EverNote, or Google Drive. Wow!!! It arrived yesterday and I immediately got to work scanning. I can’t believe how easy it is to use. And fun : ) I scanned insurance policies, kids school reports and medical records, friends greeting cards with pictures of their kids which I had taken off the fridge but felt guilty throwing away… I feel so FREE!! So far I have two bags of recycling! With much more to come. I know, I should shred this stuff, but there is so much of it, I may just have to live dangerously and throw it straight into the recycling bin unshredded. All these docs are now stored on EverNote, where I have a free account set up in. I may go back and tag documents and put them in folders, but with the search function all I have to do is type in “vaccine”, and the kids medical records should come up. Last night I watched a documentary called, Tiny, about a couple that builds a tiny house. I am a bit obsessed with watching videos on the tiny house and micro apartment movement! I love them. Here is a good one! My dad and his wife have actually lived full-time in their RV for years, so I guess it runs in the family. My friends would laugh if they read this, because my house is pretty big (by city standards) and I have a lot of stuff. But I love seeing how they pare down to the absolute minimum. I love seeing how they organize everything so perfectly, with a place for everything and everything in its place. And how they use every nook and cranny for storage. It totally inspires me. I definitely don’t want a smaller place! But I love thinking that the more I can get rid of, the more open and spacious and organized my house will be. I have a lot of things, but I’m definitely not a pack rat either! Considering that I don’t have a basement or an attic, I’m doing pretty well, for an American mother of two. I was terrified about the lack of storage when I first moved here because my old place had a basement the size of my entire apartment! But, it was filled with so much junk that I never wanted to go down there to look for anything. Winter clothes stored for the summer would disappear, never to be seen again. Trips to the Goodwill would be postponed indefinitely as bags of giveaways were just thrown down there. Now with just a few closets for storage, everything is literally in arms reach. And I’m forced to get rid of stuff instead of storing it forever. I have actually experienced life as a minimalist. Yesterday I was remembering how in Senegal I lived in a studio and owned one towel, which was for the shower or the beach, and would also serve as a potholder. I knew I’d be moving back the US at some point, so I didn’t accumulate much. Plus, shopping was a huge pain there, having to haggle at the market for every little thing I bought. Life was so simple back then. Whenever I go into a camping or a travel store, I marvel at the little mini and practical objects. I love the little foldaway and nesting items. The Swiss Army knife that contains 12 different tools. The towel that rolls up and can fit in the palm of your hand. Or the little mini iron. I always think everything in my house should be so cute and little and practical. But no, not only do I own a cute mini travel iron, but I own a full sized one too. This is especially ironic considering that I can’t even remember the last time I ironed, it’s probably been years. Well, I have a long way to on my road to minimalism, but I am making progress. Today I tackled the cabinets under my bathroom sink. I threw away three small grocery bags worth of junk, and organized the rest. I also worked on my daughter’s room with her for an hour and we made some good progress. Scorpion pose update: I just tried a couple of minutes, and it didn’t go so well! I don’t usually have any trouble getting upside down and can hold headstand for several minutes. But today when I flipped upside down all the blood rushed to my head and I felt like my face was going to explode! What’s up with that? High blood pressure? Low blood pressure? Don’t know! Well, I kept at it and practiced scorpion for a couple of minutes. My balance is not great today, but it’s a start. I had a beautiful day. I started early at the gym with a free fitness evaluation/training session. I wasn’t actually that impressed, but he did give me some core exercises that were really great! Spent the morning at my son’s last soccer game of the season. He will remind me for years about the games I miss (he’s a bit of a complainer…) so I know he really appreciates it when I’m there. I went jogging again today!! Twenty minutes without stopping. It felt great!! No pains. I was definitely ready to stop at twenty, but I kept walking afterward, it was such a perfectly gorgeous day. And, I helped my daughter sort through her closet. Apparently she hasn’t put clothes away in months, maybe years. She had a huge pile of clothes just stacked in there, mostly clean but with some dirty, some of her brother’s clothes, and some of mine! We also went through her drawers. Jeez. We found items that looked like they hadn’t fit it 5 years! We got rid of three garbage bags of too small clothing, and we are not even done yet. My hope is once it’s organized she’ll be able to maintain it herself, but that may be wishful thinking! So today: exercise, cardio, quality time with kids, decluttering, spring cleaning, green smoothies, and time walking/running around a pond and surrounded by trees and nature. 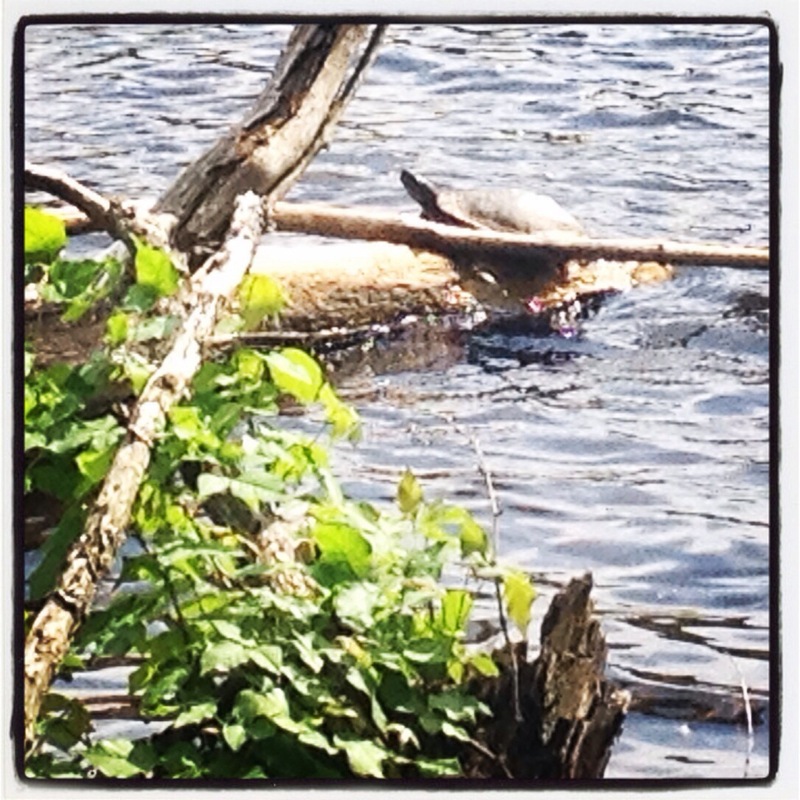 And I saw a turtle!! I’m an aspiring Minimalist. I got rid of several big bags worth of stuff this weekend, and it felt great!! There was a point when I thought my inner minimalist would never find her way out, but slowly but surely, I have definitely been making progress. I do still have a lot of stuff, but just aspiring to have less, and actively avoiding bringing in more, makes a big difference. My three barriers are 1) I will buy just about anything if I think it will make my life more convenient, or somehow enrich my life. This includes lots of games for the kids, and things like musical instruments, art supplies, etc. 2) I don’t like getting rid of things if I feel I haven’t gotten my money’s worth out of them. 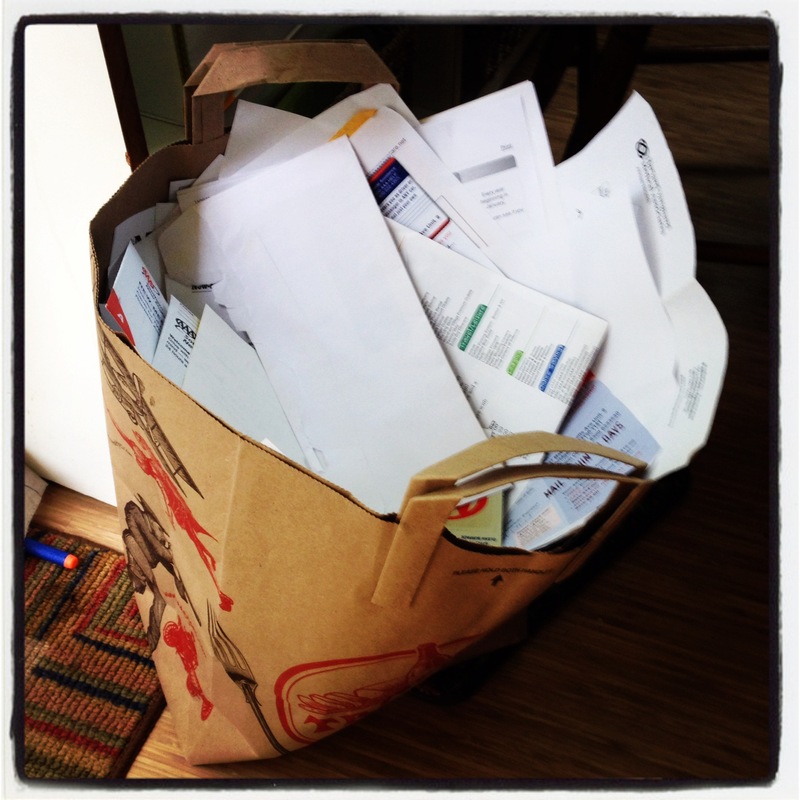 3) Decluttering takes time, and I don’t like spending time doing it. I recently decided I shouldn’t feel too bad about this, I figured, in a few years the kids will off with their friends and off to college and I’ll have a lot more free time, and no excuses. Some tips that have helped me are: I don’t “collect” anything, not even music or DVDs; I do own a fair number of books, but I usually get them from the library unless I think I’ll want to reread them; I hate shopping, and definitely don’t do it as a pastime; I let my Costco membership expire because I realized I just don’t have the storage space to buy stuff in bulk; I love the feeling of giving stuff away; if I can’t get rid of clutter, I at least try to hide stuff! I don’t aspire to be extreme about it. I don’t need to pair all my belongings down to 100 things. I don’t need to live in a 10 x 10 microhouse (although I do LOVE microhouses!) I like a place to feel lived in, not barren and bare. I like colors and art. But I also like open and clear spaces, and recognize that life really is more relaxing and beautiful with less junk. One book I read on decluttering had a great quote, she said something like, People often hang on to things they don’t use because they think they may need them someday, there is a great place to keep items like that, it’s called The Store!